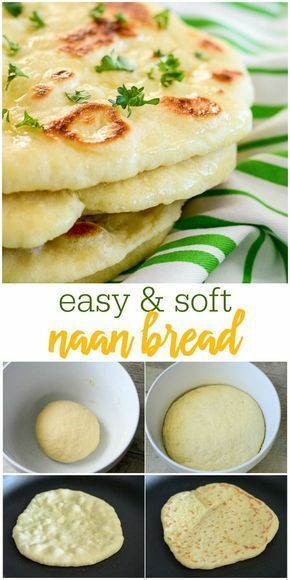 This homemade Naan Bread is soft, chewy, and simply delicious. You won't believe how easy it is to make and will want it as a side to every meal. Combine warm water, yeast, and sugar in a large bowl; let sit for five minutes or till bubbly. Add olive oil, yogurt, egg, salt and 2 cups of flour. Stir till smooth. Add enough flour to make a soft dough. Knead a few times on a floured counter until smooth. Place dough in a greased bowl. Cover and let rise in a warm place until doubled. Cut dough into eight pieces. On a floured surface, roll out each piece into a 6" circle. Add a little oil or non-stick spray to the skillet. Cook each circle for 2-3 minutes or until bubbly and golden brown on the bottom. Flip over and cook for another 2-3 minutes. Brush the top (the bubbly side) of each naan with melted butter. I added garlic to my butter, but that is optional.